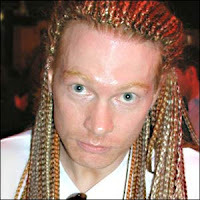 Frank the Obunny's Obrillobama Oblog: Dr. Pepper, Axl Rose & Chinese Democracy. Oh My! Dr. Pepper isn't the plastic surgeon who lost a malpractice suit for botching Axl Rose's facelift. Turns out Dr. Pepper is a soda-pop. Still, Dr Pepper is making good on a promise to provide every person in America a can of the soft drink if Guns N' Roses' “Chinese Democracy” were to arrive in 2008, and has revealed details of the plan. Interested fans are being asked to visit DrPepper.com (http://www.drpepper.com/) on Nov. 23, the day “Chinese Democracy” is released in the U.S. exclusively via Best Buy. After registering online, fans will receive a coupon redeemable for a 20-ounce Dr Pepper wherever the drink is sold. The twist: The coupon is available for only 24 hours and will expire on Feb. 28. "Chinese Democracy" is the album Guns N' Roses started writing & recording in 1994 (when Guns N' Roses was still Guns N' Roses). Axl Rose has used a revolving-door lineup of musicians to record and tour promoting the album since the Clinton administration. The first single from "Chinese Democracy" - the title track - is now available on iTunes. Many tracks surfaced on the internet earlier. Frankie's had a listen, and they're not any worse then the Chris Cornell / Timbaland fiasco.